Alsi Seed | Become Healthy or Extinct! Description: Numerous studies suggest that Alsi seeds are the rich source of Omega 3 fatty acids, protein, fiber, vitamin B1, B6, magnesium, manganese, copper and other health supporting phyto-nutrients. Omega fatty acids are essential for cardiovascular, digestive, brain and nervous system health. It can also support hair and skin health. 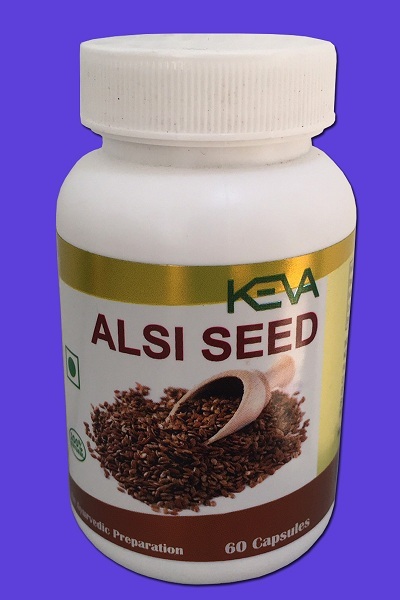 Benefits: Alsi Seeds, also known as Flax seeds, are beneficial in cardiac disorders, digestive diseases, cancer and diabetes. Alsi (flax) seeds are one of the world’s renowned super foods. These seeds are very nutritious and helping in a several health conditions. They are very rich in Omega-3 essential fatty acids. Alsi seeds also contain a good amount of dietary fiber and Lignans. Ingredients: Alsi seeds, Microcrystalline cellulose, magnesium stearate (vegetable grade), Silica. Directions for use: Take one capsule twice daily on an empty stomach or at least half an hour before morning and evening meal. For better result, continue to use for 6-12 months.